There are probably a lot of good reasons not to order unregulated alcoholic slushies off the internet, via a private Instagram account. But late last week, with the weather finally warming up, I couldn’t think of any. So, after taking the necessary steps, I had a batch of Phrosties delivered to the New York Magazine offices. Like those quarts of Nutcracker in bodegas’ back coolers, or the legendary frozen margaritas once sold to go at El Sombrero, Phrosties join a proud legacy of clandestine New York City booze. These, however, are engineered for the social-media age. To get some, you just request to follow the semi-official Instagram account, which gives you access to the necessary phone numbers. Text the right one for your borough, then wait for the delivery person to show up. They arrive with Igloo coolers full of Phrosties, priced $10 each (plus tip). The flavors have names like Blue Hawaiian, Dragonberry Colada, La Phiesta, and Hero — good luck figuring out any of the actual ingredients. All told, the entire process took me like two hours. The service itself has been around for a little less than a year, but as word has traveled, it’s taken off in the last few months. 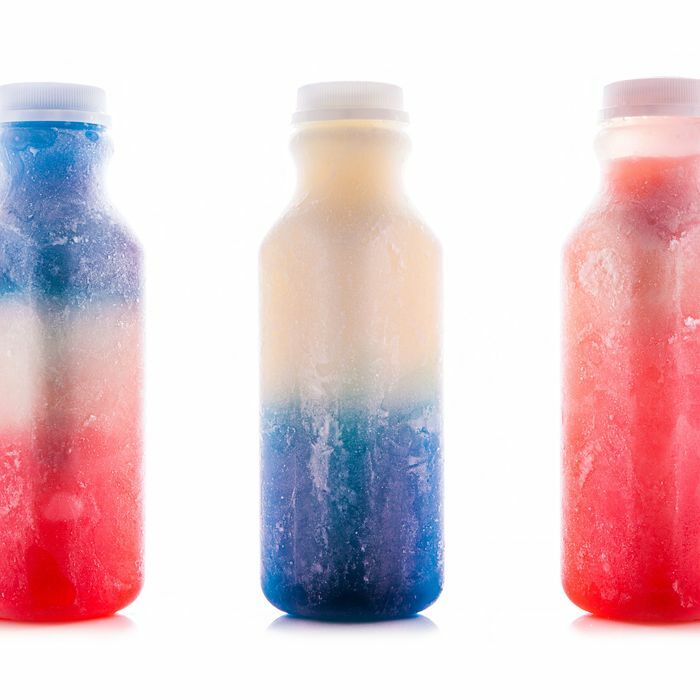 The appeal is obvious: alcoholic slushies, delivered to your door, 24/7. Buying them feels like the cartoon version of a drug deal, and some people will point out that this is kind of a dicey proposition. Order drinks from untraceable strangers and have them delivered to your exact location: As long as you don’t have a keen sense of self-preservation, it’s hard to beat the convenience. Phrosties are also a sight to behold: semi-frozen, technicolor concoctions of sugar, ice, food coloring, a lot — a lot — of alcohol, and who knows what else, icy with a pastel ombre effect. They are eminently Instagrammable, like avocado toasts for the Bushwick party set. But the real question is, how do Phrosties taste? They're the liquid version of that "Turn Down for What" video: It's like drinking frozen Kool-Aid, mixed with Red Bull and spiked with 150-proof Everclear. But to get an expert opinion, I took some to New York's esteemed restaurant critic, Adam Platt. "This is just pure sugar and grain alcohol," he said after his first taste. "I already have a headache." Even still, he understood the allure: "After the first sip, you’re loving the sugar. After the third sip, you’re thinking how pretty the colors look and why can't you feel your lips? After chugging the whole thing, who cares? You’re lying blotto on the sidewalk and all is bliss." Update: Is the party over? As our pals over at Daily Intel note, Chuck Schumer is on the case and the main Phrostie Instagram account has been wiped clean. Time to phigure out a new delivery method.